Wire rod is a hot rolled intermediate steel product produced from a semi normally a billet and having a circular, rectangular or other cross-section that is typically produced in nominal diameters of 5 mm to 20 mm in irregularly wound coils, primarily for subsequent drawing and finishing by wire drawing units. The range of materials in which wire rods are produced, comprises low to high carbon steels, cold heading steels, wire drawing steels, alloy steels, spring steels, ball bearing steels, electrode quality steels, reinforcement bars, tool steels and stainless steels. Wire rods are categorized by the ‘quality’ according to end use. Industrial quality wire rods which are made from low carbon or mild steels, account for majority of wire rods production and consumption. These wire rods are primarily intended for drawing into industrial quality wire which, in turn, used for the manufacture of such products as garment hangers, wire mesh, barbed wire, nails, and fencing etc. Wire rods are produced in wire rod mills to meet needs for specific applications and quality requirements of the customers. The desired metallurgical properties are imparted by adjusting the chemistry during steelmaking as well as by rolling and cooling practices. The wire rod rolling process determines the rod’s size (diameter) and dimensional precision, depth of decarburization, surface defects and seams, amount of mill scale, structural grain size, and within limits set by the chemistry, tensile strength and other physical properties. Standards of product quality (e.g. tighter dimensional tolerances, control over residuals, and coil weight) have become tighter in recent times along the entire range of wire rods, largely in response to customer demands for improved performance on the customer’s equipment. The quality, end-uses and important characteristics of wire rods are given in Tab 1. Since wire rods coils are in most instances transported in an unwrapped condition, they are therefore usually affected by rust. They are sometimes stored in the open prior to their transport, so it is not uncommon to observe water dripping out of the bundles when they are transported. 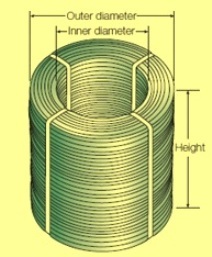 This is a hot drawn product which is subjected to further processing in order that it might be directed to a large range of end uses, such as the manufacture of nails, galvanized wire for fencing (including barbed wire), road mesh, and wire for pre-stressed concrete to mention a few applications. Many dispatches of the wire rods are eventually destined to be cold drawn. During this process the wire is forced through dies which reduce its gauge, and cause it to increase in length. Because of this, kinks and nicks in the wire are inadmissible, as when being drawn through the dies the wire can break. Even if the wire is not for redrawing such defects are undesirable, e.g. in the manufacture of road mesh, as these imperfections show up in the finished product. Disintegration of bundles during the transport, caused by bad stowage, crushing and breakage of the strapping bands, is to be avoided as this leads to lose turns of wire which develop into tangling, intertwining and twisting of the wire rods. As a result of this, parts of the coils may have to be cut off and scrapped. If this is not the ultimate solution, depending upon the uses to which the wire rods is intended, tangling and twisting of the turns in the bundles results in loss of time on the production line. When the wire rod coil is wrapped, this is an indication that the goods are destined for a fabrication of a more delicate nature, e.g. wire for musical instruments. Special steels wire rod coils are usually protected from corrosion and mechanical stresses (e.g. scratching and buckling) and are generally provided with multilayer packaging using corrosion protection (e.g. oiled or VCI paper) or film-coated packaging paper and plastic films. Wire rod coils must be handled carefully owing to its sensitivity to mechanical damage. Damage may be prevented by correct handling and the use of suitable handling and slinging equipment (e.g. crossbars, C hooks, coil mandrels, webbing slings, chain slings). Lifting or setting down the wire coils with excessive force results in distortion, which is detrimental to further processing, since the wire coils can no longer be properly unwound and further processed. Wire rod coils must be transported in vehicles or railway wagons having a headboard and side walls (stanchions) with sufficient strength and loading capacity. Nonslip material must also be placed under the load and between layers. Gaps in the load are often unavoidable due to the handling methods used and vehicle characteristics (load distribution), so the load must be secured in accordance with anticipated accelerations by direct securing (e.g. tight fit, loop lashing) and/or by frictional securing (e.g. tie-down lashing).